Business Pro Stapler offers die-cast construction for precision performance over a lifetime. EZ remover integrated slide-out staple remover delivers the ultimate convenience. Simply slide out to use. Onboard staple storage keeps extra standard staples close at hand. Rubber grip and base deliver ultimate stapling comfort and stability. Stapler stands upright or lies flat. Design also offers No-Jam stapling, permanent or temporary clinch for added flexibility and 180 degree tacking. 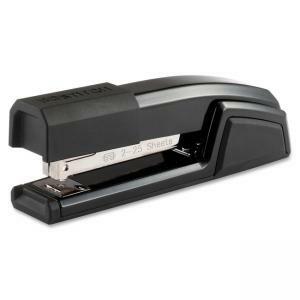 Stapler fastens up to 25 sheets at a time.